Your dream trip involves some of the highest mountains and the longest glaciers in the world. It includes strenuous hikes, remote lodges, traditional villages, and ancient monasteries. While it takes you as far away as Bhutan, Tibet, Nepal, and Pakistan. That’s right, Pakistan. The South Asian country is one of the best-kept secrets for adventure travelers. Gilgit-Baltistan, the Northern Areas of Pakistan, are remote. Very remote. This part of the world—along with Jammu and Kashmir, an autonomous state in India—was largely inaccessible before the 1980s. Few roads led into the Western Himalayas; those that did were treacherous. 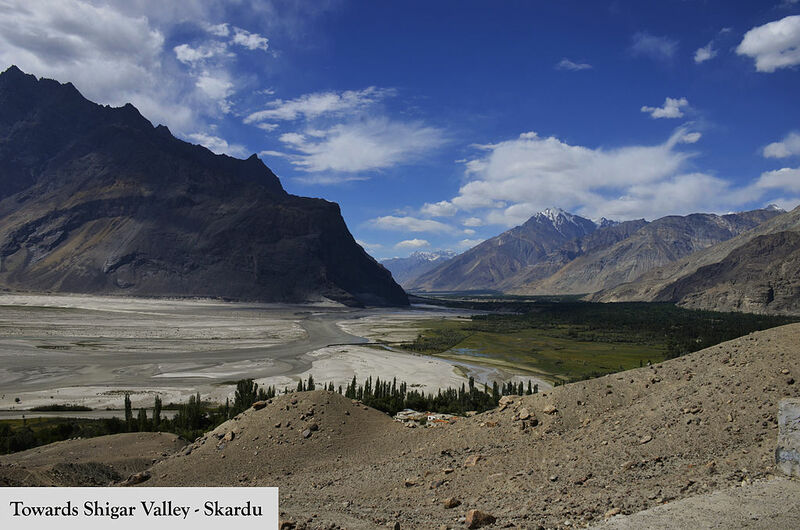 So places like the Shigar Valley remained frozen in time. The mountains, including K2 and Nanga Parbat, had only been conquered by professional climbers. The glaciers weren’t receding at alarming rates. Forts, mosques, and rock art hadn’t been turned into must-see sites. While the Balti people, of Tibetan descent, spoke Urdu, a language unfamiliar to the rest of the country. The eight-thousanders (the 14 mountains around the world that are each more than 8,000 meters high) are now on the bucket list of almost every hiker around the world, and the glaciers are now calving faster than scientists predicted. But little else has changed in Northern Pakistan. You arrive in the beautiful Shigar Valley to find the Shigar River rushing with melt water from the Baltoro and Biafo Glaciers. Walnut, apricot, cherry, and pear trees grow in the fertile soil. One of the oldest mosques in the country is now protected as a UNESCO World Heritage Site. Plus a 400-year-old fort was turned into a small hotel. 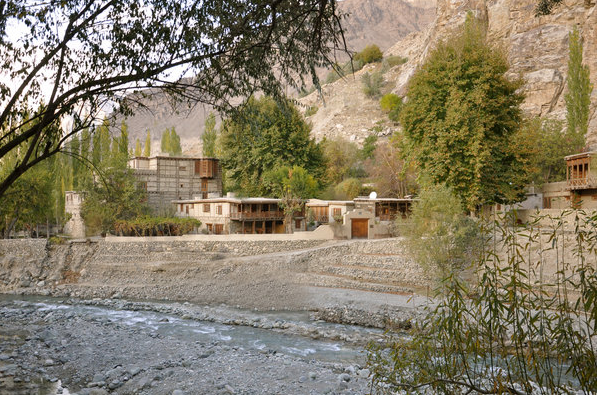 That small hotel is the Serena Shigar Fort. The Raja Fort Palace was originally built for the Amacha Dynasty in the 17th century around a huge cone-shaped rock. The stone-and-timber buildings looked like they were rock formations that merged into the mountainside. About ten years ago, the fort was restored and turned into a hotel. Traditional rooms with wooden beams, walnut floors, and period furniture fill the main building. The former horse stable is now the Old House. While slightly more modern rooms were built in the Garden House. Antiques and handmade textiles decorate them all. You’re welcomed to the hotel with a warm drink and a basket of freshly picked fruit. Except for the sound of rushing water and chirping birds, it’s quiet and peaceful. Even the staff seems to glide silently between the buildings. Walk through the fort’s Grand Audience Hall to learn about the Balti culture, and see wood carvings and artifacts. Climb the hill behind the hotel to see the ruins of an even earlier fort. Visit the wooden mosques in Shigar. Khingron Mosque sits beside the fort, and Amburiqu Mosque, from the 14th century, was recently restored. See the ruins of a Buddhist monastery and rock inscriptions from the 5th century. Then stare at the snow-capped peaks as you plan your own trek into the imposing mountains. Your dream trip is off to a perfect start.